The Visual Product Configurator Custom Text Addon allows the customer to add a custom textfield, with a custom color and font, to the preview area of the product customization. The text value of the field is usually sent with the order of the customized product. Download the add-on from our site. Go to your WordPress Admin Panel and click on Plugins > Add New to access the plugins installation screen. Then click on the upload link to access the plugin upload page. Click on the Choose file button and select the plugin installable zip archive (most likely named “visual-product-configurator-custom-text -addon.zip”) you downloaded in the first step. Once the plugin is successfully installed, please click on the Activate Plugin link to activate the plugin. 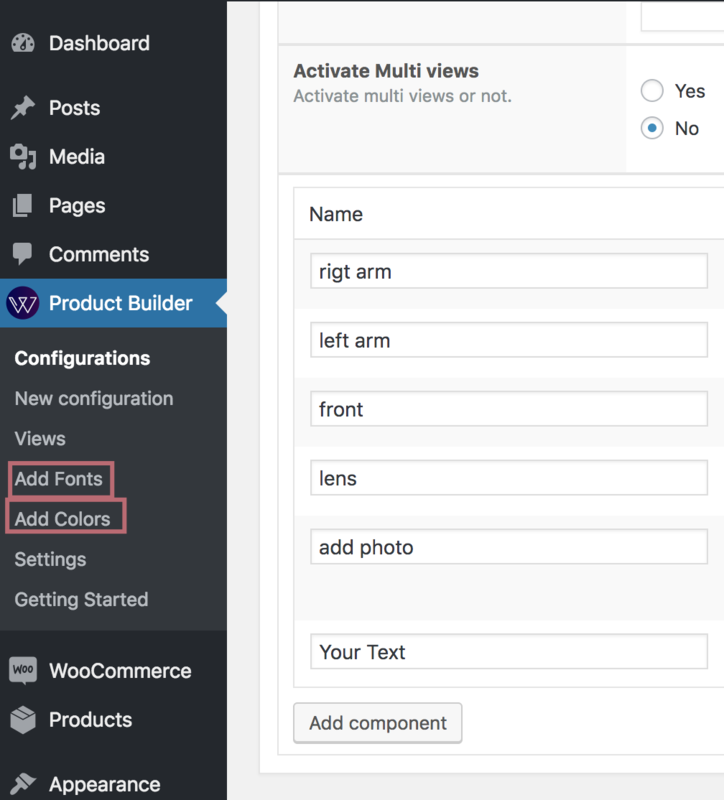 Go to “add fonts” under the “product builder” menu in the WordPress Admin Panel. Add all the fonts of your choice. Then go to “add colors” define all the colors of your choice. Next go to “Configurations” and click on “add component” to create your custom text option. Choose “simple textfield” as your component behavior option. Next click on “Manage options” and define the price and the text positions. Finally go to “Settings” and select whether or not to display the custom font or color on the configurator page.